I usually start my fishing season by attending the Moncton Boat Show. There is no better way to get the “fishing” juices flowing than seeing and getting reviews on new tackle and gear. One of the first things that caught my eye this year was the "Bert’s Bugs and Flies" booth run by Bert LeBlanc. 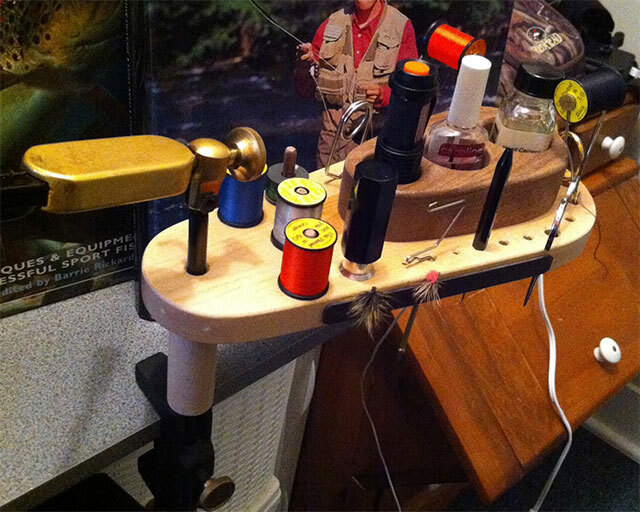 Bert not only ties flies, he makes fly-tying wooden tools and fly-fishing art. Bert showed me his wooden vise caddy that goes on the stem of your fly-tying vise. He uses multiple types of wood for a great look. His vise caddy has a cleverly designed wooden frame, five spool posts and 21 different sized holes for bobbins, scissors and other fly-tying tools. There are three larger holes on the top for head cement, a hair stacker, etc. It also includes magnetic strips on both sides to hold hooks for drying. For more information about Bert’s Bugs & Flies, contact bertsbugs@gmail.com.